The Tunisian pavilion of the Venice Biennale has commissioned Khaled Jarrar to contribute to its online multimedia platform. As part of the exhibition, The Absence of Paths, artists from around the world have been invited to contribute texts and images to a digital repository that reflects on migration. Nearly one hundred contributors are featured, including artists Zineb Sedira and Mounir Fatmi and writer Shumon Basar. Organised by curator Lina Lazaar, The Absence of Paths is Tunisia’s first-ever representation at the biennial. For the online platform, Jarrar writes on his recent experience of travelling through Europe with a Palestinian refugee family fleeing Syria, invoking the memory of his grandmother, who was displaced from her home in Palestine in 1948. Over the course of several weeks, Jarrar navigated the path of migrants, documenting the conditions and hardships they face. 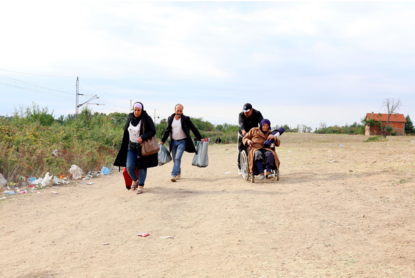 Image: Mona, Yousif, and Mohiee pushing his mother Nadira to cross the border to Serbia. Courtesy of the artist.